Dr. Maria Kim implements the latest evidence-based dental treatments in our Arcadia, CA dental office for the comfort of our patients. Since gum recession is a common oral health condition for many of our patients, seeking an effective, less-invasive treatment option became a priority. At Maria Kim, DMD, we proudly offer AlloDerm Regenerative Tissue Matrix to improve patient comfort and positive long-term results of gum grafting. Gum recession has a number of causes including genetics, aggressive brushing and flossing, poor tooth and bite alignment (malocclusion), bruxism (clenching and grinding your teeth), poor oral health, and trauma to your gum tissue. The consequences of gum recession can place your oral health at risk and create discomfort in day-to-day life. Recession exposes the root of your tooth, making it susceptible to decay and infection. Receding gums can cause sensitivity when you brush, floss, or consume cold foods and beverages. Plaque adheres easily to your softer root surface, potentially creating tartar, gum infections (periodontal disease), bone loss, and decay. Gum recession significantly impacts the appearance of your smile, showing elongated teeth and exposed root structure. Until recently, gum recession typically called for surgical intervention that included self-donated gum tissue, generally taken from the palate (roof) of your mouth. This technique can cause unnecessary pain and longer healing times that may not be necessary. Using AlloDerm RTM, we can restore your gum tissue without removing healthy tissue from your palate. This method of tissue regeneration can provide a long-lasting, esthetic outcome that lasts for years – even decades. Rather than self-donated tissue, AlloDerm RTM uses extensively tested and screened donor tissue that has had the cells removed, leaving a regenerative tissue medium designed to encourage healthy gum tissue growth. This provides patients with a more comfortable option to traditional gingival grafting and eliminates surgical complications due to palatal tissue removal. Dr. Maria Kim will cover your personal post-treatment instructions so you have a systematic process to attain the most successful and long-lasting outcome. If you suffer from gum recession and sensitivity, contact us to schedule an exam with Maria Kim, DMD. Her experience, clinical skills, and gentle treatment style gives our patients outstanding results and confidence in their dentistry. For the first 24 hours following surgery, your diet should be restricted to cold liquids. Yogurt, smoothies, milkshakes and dietary supplements such as Instant Breakfast or Ensure are good choices. Avoid peroxide, alcohol, carbonated beverages, and drinking through a straw! After the first 24 hours you may have soft foods such as cooked vegetables, fish, pasta and meatloaf, which are easily chewed. You should use utensils and avoid chewing at the surgical site for two weeks. If you take nourishment regularly, you will feel better, gain strength, have less discomfort, and heal faster. Call us for more information! As with all procedures, there are some risk of side effects that could occur when getting a gum graft. In order to make sure our patients are fully informed, we've uploaded our consent form with a full list of potential risks on our website. Click here to read the gum graft consent form. Gum grafting is a surgical procedure where new tissue is used to bring a patient's gum line down or reinforce their pre-existing gums. 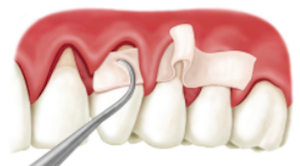 Gum grafts are often used to fix gum recession which can leave the roots of the teeth over-exposed and sensitive. The material used in a gum graft can be from other areas of a patient's mouth or it can be a donor tissue such as AlloDerm Regenerative Tissue Matrix. Call us today for a consultation. Using your own palatal tissue is not your only option for gum grafting anymore. You can also choose to use AlloDerm Regenerative Tissue Matrix Treatment which is donated palatal tissue that lacks any DNA. Using AlloDerm is just as effective as using your own tissue and decreases your pain after the procedure because you no longer need to remove your own palatal tissue. Read our page on Soft Tissue Regeneration or call our office about this procedure and using AlloDerm! If you need another reason to schedule the next appointment with your dentist in Arcadia, recent research shows that choosing to address periodontal disease reduces the risk of stomach cancer. Periodontal disease is an inflammatory condition caused by infectious bacteria. Pre-cancerous lesions in the stomach are linked to an increased instance of Helicobacter pylori (h. pylori) commonly found in the esophagus and stomach. The amount and diversity of pathogens within the mouth are directly related to increased systemic conditions and cancer risk. Does eating foods such as ice cream cause pain or discomfort? Have you noticed that your gum line is higher than normal? Don't let cold sensitivity stop you from enjoying your favorite, frozen treats -- our office can help! With a simple gum grafting treatment, we can help lower your gum line back to a comfortable level and simultaneously improve any related cold sensitivity.